Here is a picture of me, a few years ago and of me, a long time ago. That car in background gives away my age. 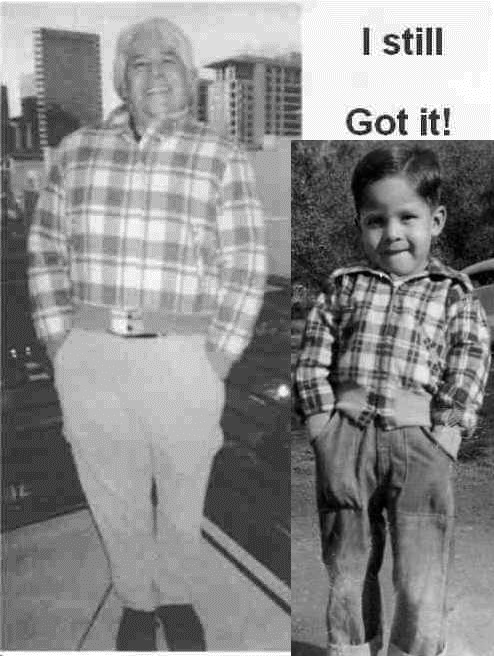 (An old friend of the family, Carlos LeGerrette, touched up the picture of little me.) This website gives some language and culture as I remember it. I am 70 years old (2018) so I am an Elder of the tribe. I am actually a coder and click here to find my Excel Macros. The word "Howka" means hello. This site is iPhone friendly, if you access this with your iPhone you will get a different presentation. By clicking on any of the buttons below, the user agrees not use any information contained in the site, or any of its related links, for commercial, or profit making purposes. Further, the user holds the creator of this site to be faultless for any inaccuracies or omissions.